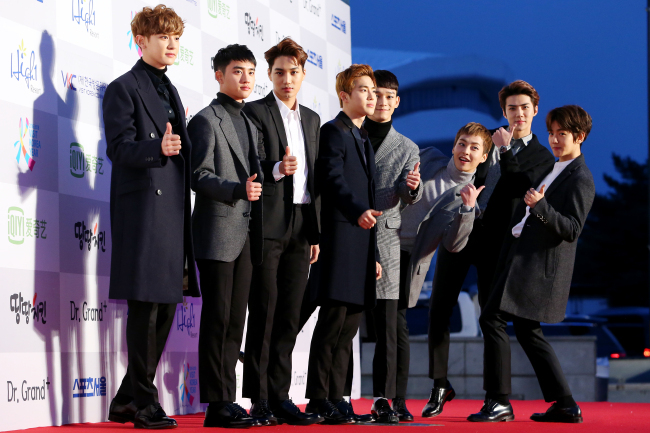 EXO, a boy band divided into two subgroups “EXO-K” and “EXO-M,” promoting the same music simultaneously in Korean and Mandarin, respectively, won the Grand Prize for the third consecutive year at the High 1 Seoul Music Awards on Thursday. EXO’s three-year winning streak broke several past records: Seo Tai-ji and Boys won the Grand Prize in 1992 and 1993, H.O.T. in 1997 and 1998, Jo Sung-mo in 1999 and 2000, and Girls’ Generation in 2010 and 2011. The group also recorded the Triple Crown for three consecutive years, winning the Grand Prize, Main Prize and Hallyu Special Award this year. The Main Prizes were given to 12 teams including EXO, BigBang, Yoon Mi-rae, SHINee, Bangtan Boys, Taeyeon, Sistar, A-Pink, EXID, Red Velvet, VIXX and Zion T.
EXO topped the Hallyu Special Award given based on voting by fans abroad from Nov. 27, 2015, to Jan. 12, 2016, with 56.8 percent of votes. The popularity award selected by a nationwide vote went to JYJ member Kim Jun-su.